Rastafari mash dem down awredi, wi a go mash dem down again how long can the wicked man pretend? And so the album starts, an concious Lyrics an Vibes never stop flowing on this FABULOUS album by di man called Chezidek! Born in Seville (St. Anns Bay) on the 20th of June 1973 as Desbert Johnson. Di Upfull, Spiritual, Humble an Righteous singer, Earned him name, Chezidek (which originally was Mel- Chezidek) After moving to Kingston him release him first album in 2002 called "Harvest Time" by VP Records, which really mek di Vibes flow inna Jamaica an all ova di world! With tunes like: Shall not be moved, Naturally, Zion High Keeper, Break Free and other conscious scorchers, him mek him Star visible in it’s Rightfull place…Inivershally!!! The follow up one called "Rising Sun" (VP Records 2005) placed it even higher! So that raises the question…could him tek it up beyond da one deh??? 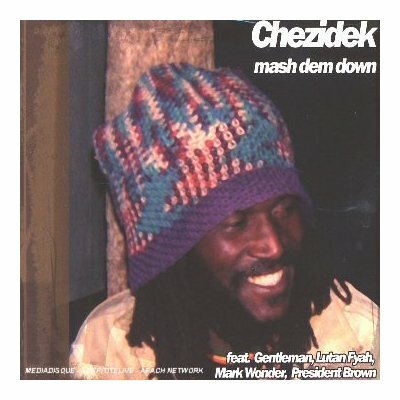 (Jus mek I man tell yuh di answer,..Jah know him can…the proof…this album "MASH DEM DOWN," released on August 24th 2006 on the AL.TA.FA.AAN Label. With Ft.artists like President brown on DEM NAH GOOD, Lutan Fiyah and Mark wonder on ONLY THE STRONG an Gentleman on DON’T YOU…him really set up an album not to be missed!!! Other titles pon this 14 track album are, I AN I (Blessed Inity forIva), NOTHING GOOD IN DEM(straight as an arrow:) an others,wich again I say…yuh really haffi check out. Like mi A seh awredi…not to be missed in your concious roots selection. For this Bredda a go set yuh all up IRIE J, with concious Lyrics an Vibes.…Fi True! Soulfull SoulJah…Trodd on on di road a Righteousness, Blessed Isses all a di way I Pray, fi di Breddaman Chezidek an all a yuh who read this…Icerely.